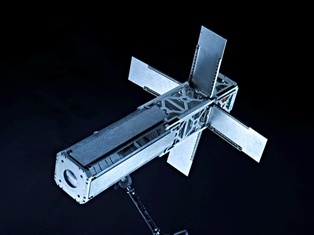 The VELOX-1 mission is comprised of the VELOX-1-NanoSatellite (NSAT) and the VELOX-1-PicoSatellite (PSAT) to demonstrate inter-satellite communications in orbit. Also, the project allows engineering students to participate in a multidisciplinary hands-on space project as VELOX is the first NanoSatellite of Singapore, designed and built at Nanyang Technological University. 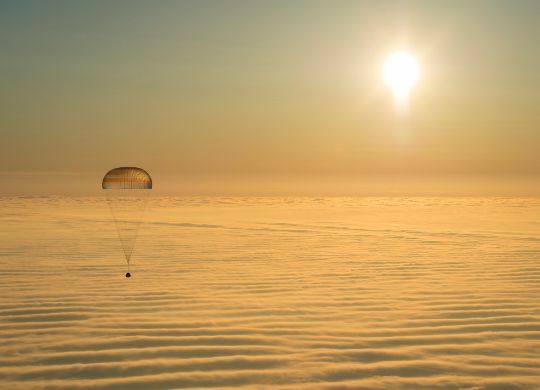 Secondary mission objectives include the acquisition of high-resolution Earth imagery and the demonstration of various payloads such as a vision system, a dual-field of view sun sensor and a quantum physics payload. 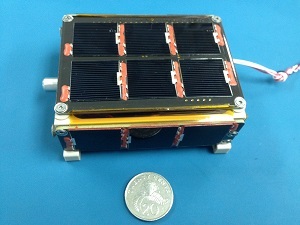 The VELOX NSAT is a 3U CubeSat that measures 10 by 10 by 34 centimeters with a total mass of 4.5 Kilograms that include the 250-gram PSAT which is just 6 by 7 by 3 centimeters in dimensions. 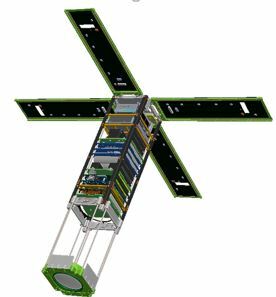 The NanoSatellite consists of a Aluminum alloy chassis with load bearing parts made from stainless steel. The separation system, solar panel deployer and the optics extension system all use spring-loaded mechanisms for deployment after launch. NSAT features four deployable solar panels hosting Gallium-Arsenide Solar Cells delivering a peak power of 28.8 Watts. A 5,200mAh Li-Ion battery is used for power storage and a dedicated distribution unit delivers power to all satellite subsystems and payloads. Thermal control is ensured by multilayer insulation and heaters that maintain survival temperatures. Attitude determination is provided by two Inertial Measurement Units, one dual-field of view sun-sensor and eight coarse sun sensors. Stabilization and three-axis control is accomplished by three Reaction Wheels with three magnetic torquers for momentum dumps. A GPS receiver is used for orbit determination. Dipole antennas are installed on the satellite for communications in the UHF and VHF bands reaching data rates of 9,600bps for downlink using BPSK modulation and 1,200bps for uplink that uses the AFSK protocol. NSAT is controlled by a main processor operating at 100MHz using a 2GB SD card for data storage and a UART and I²C data interface to connect to the various satellite systems. The PSAT uses body-mounted solar cells to generate sufficient electrical power to operate the satellite controller and a communications system that will be used for a demonstration of inter-satellite communications. After launch and checkouts, the PSAT will be separated from NSAT by springs and start drifting away. Communication demonstrations will then begin to test out a space-to-space data link between the two satellites as the distance increases to determine the maximum possible range. The Quantum Physics Payload installed on NSAT is 10 by 10 by 3 centimeters in size and weighs about 300 grams. The payload uses a laser diode to create photons, a logic circuit and a pair of photodiode detectors. It uses miniaturized equipment to generate photon pairs to demonstrate quantum entanglement in orbit – a phenomenon that occurs when pairs or groups of particles interact in a way to that the quantum state of each particle can not be described independently, only the state of the system as a whole can be described. Quantum entanglement has been subject of many studies on the ground and in space, however many fundamental questions remain open. Flying quantum physics payloads on CubeSats allows many of such experiments with different parameters to be flown to gather a large data set on quantum entanglement in the space environment. The second payload of the NSAT spacecraft is an optical imager that consists of an optics system, a CMOS sensor, an FPGA data acquisition board and a Payload Processing Unit. The optics unit features uses and extendable architecture – the required focal length is achieved by deploying the optics via a spring-loaded mechanism. The imager uses a 10.5 centimeter focal length that focuses the image into a radiation-hardened CMOS image sensor. Data from the sensor is retrieved via a field gate programmable array with 32MB RAM. The VELOX-I NSAT has been built to operate for two years while PSAT will function for around one year which is sufficient for the comm demonstration mission.